It was only a matter of time before this one made it into the series. It is quite possibly my favourite film of all time (big claim)! The book however is a different matter. I really like it, I enjoyed reading it and Nicholas Sparks is one of my favourite authors but I wouldn’t say this particular read is a favourite. Why? I think because I had watched the film so many times before I picked up the novel I was reading it very much with the film in mind and it just didn’t live up to it for me. It’s a great book, I can’t deny that, it just didn’t have the same lasting effect on me that the film did. As always, I’m going to start by giving a little background on both the film and the book for anybody that may not be familiar with them. A Walk to Remember was first published in 1999, written by Nicholas Sparks. It is mainly a fictional piece but was inspired by his sister who suffered cancer and sadly passed away in 2000. It follows Landon and Jamie, an unlikely couple, who are thrown together due to varying circumstances which leads them to fall in love. This is something that Jamie really didn’t want to happen because she is guarding a big secret, one that will change everything. This secret is that she is seriously ill. We follow the journey of the young couple and get to witness their love grow, Jamie’s unwavering faith and Landon’s strained relationship with his father. As the story progresses and Jamie’s health declines, we find out whether their love is strong enough to survive. The film adaptation was released in 2002 and saw Mandy Moore tackle the role of Jamie and Shane West portray Landon. The film follows many aspects of the book, so I won’t repeat myself by listing those here. I also don’t want to give too much away about the differences between the two yet, (I shall save that for the comparison below). Instead, I will share that the film gained predominantly negative reviews from critics but was well received by the public upon release. With that said, let’s get into exploring the main differences between the two and my attempt to answer the question: which is better? The novel begins in the present day with a middle aged Landon reminiscing. From there it jumps back to when he was a teenager in 1958 and tells the story of his final year in school, before ending in the present day once more. The film however, is set in the 1990s. It begins with the final year of school starting and ends with an older Landon returning to visit Jamie’s father, he is not middle aged at this point however! The reason for this change was explained by Nicholas Sparks himself, who stated that the fear that teenagers in 2002 wouldn’t relate to a film that was set in the 1950s as much as they would with one that was more modern prompted this difference. This makes sense. I was 12 when the film was released, and maybe 14 or 15 when I saw it for the first time and I’m not sure it would have resonated as much with me had it been set in the 1950s. So, this change, although big and something that would potentially annoy me usually, doesn’t. 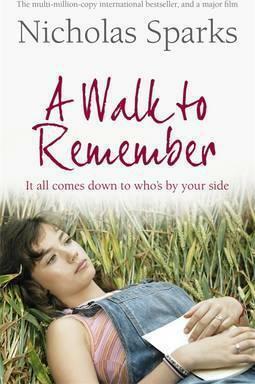 I’m not confident that I would say that if I had been exposed to A Walk to Remember as an adult though! Landon is a trouble maker in the film. Indeed it is his bad behaviour that leads him to Jamie in the first place! This is not the case in the novel, rather it is pressure from his father to do certain things that bring him and Jamie together. I pondered for a little while why I believed this change had been made and the conclusion I have reached is that it was to create greater dramatic effect on the big screen. The ‘bad boy come good’ angle is one that takes place in many films and I have to admit that, although predictable, it does make for good viewing so I can understand why the decision was made and I’m not mad at the change! In the film Landon’s father is a doctor, he has left the marital home and is living elsewhere with another woman. This has led to a breakdown in the father/son relationship. However, there is a reconciliation when Landon’s father helps fund Jamie’s home care. In the book, Landon’s father is still a member of the household but he is a politician who spends a large portion of time away from home. He is hard on Landon, his main priority is Landon’s success rather than his happiness. He does, however, pay for Jamie’s home care in the book as he does in the film. Much like the point above, I think the change was made to add to the drama for the big screen. We get to see Landon begging his father to help treat Jamie and it’s really tear jerking to see his father explain that he can’t cure her. Having said that, I’m unsure whether it would have been equally emotive to see the fractured relationship portrayed in the novel play out in the film. The jury is out on this one for me as to which I prefer. Much like Landon’s characterisation, Jamie differs between the novel and the film also. She is rather meek in the novel, whereas she is strong in the film. She can stand up for herself and this is a powerful message. With all that she has to deal with regarding her health, it is inspiring to see her inner strength remain unwavering. In both, her Christianity never falters, which is a detail that it is great was retained in both. Jamie’s faith is integral to her character so it would have spoiled her journey if it had been taken out of the film adaptation in my opinion. In the film it is clear that Jamie dies at the end. This is not so obvious in the book however. Instead it is left more open to interpretation. Sparks explained that he did this because of the love he had for Jamie, the thoughts of his sister and his overriding hope that she would live. I cried like a baby when Jamie died in the film, the ways that the story reached it’s close really got me, but, I still really enjoyed the ambiguity of the novel because it provided exactly what Sparks had intended…hope. I have to admit therefore that I wish this ambiguity had remained in the film! There are more differences between the film and the book but rather than list them all and potentially bore you, I stuck to the main ones. If there are any that I missed that you wish to share then please do! It probably comes as no surprise given my opening to this post but I think the film is better. It’s important to say though that this is a matter of personal opinion. If I’m being objective then I would have to say that I believe the novel is constructed more competently than the film. However, I just preferred watching the film to reading the novel. I’m sure I will read the novel again at some point, but I’m not as confident in that as I am that I will watch the film again, and again, and again. As always, please leave a comment if you would like to!